Weather Library > Lightning FAQ: What happens when lightning strikes a house? If you know your house has just been hit directly by lightning, call the fire department. It is common for lightning to start fires in the attic and within walls of homes. These fires inside enclosed spaces may not be visible in their beginning stages. A cloud-to-ground lightning bolt's main objective is to find the path of least resistance from the cloud to deep into the ground. Most houses are filled with many potential routes for lightning to follow in its journey. This can include gas and water pipes, electric lines, phone lines, cable TV/internet lines, gutters, downspouts, metal window frames - anything conductive in a house is 'fair game' for the lightning to follow. Lightning doesn't need conductive objects to reach ground, however - it's just forged its way through miles of air, so conductive objects in a house are a mere 'convenience' that it will use if they are available. AT RIGHT: Lightning strikes a tree and house in Charleston, West Virginia in 1998. Lightning passing through a house will often 'branch' and utilize more than one path to ground at a time. It can also jump through the air from one conductive path to another in what is called a side flash. For example, lightning may first connect to electric lines in the attic of a house, then jump to better-grounded water pipes on the first or second floor. Lightning can connect to gutters, then jump to a window frame as a 'stepping stone' to the electrical system or water pipes. All or part of bolts have been seen jumping from wall outlets to sink faucets and even across rooms! Lightning current will produce significant damage to a house that is not equipped with a good protection system. Professionally-installed lightning protection systems are expensive and the risk of a direct strike is low, so most homes do not have them. Fire danger: The biggest danger lightning poses to a house is fire. Wood and other flammable building materials can easily be ignited anywhere an exposed lightning channel comes in contact with (or passes through) them. It is most common for lightning to start a fire in the attic or roof of a house, as the channel usually has to pass through some of the structural material in the roof before it can reach a more conductive path such as wiring or pipes. When lightning current travels through wires, it will commonly burn them up - presenting a fire ingition hazard anywhere along the affected circuits. Power surge damage: If lightning chooses any of the home's electrical wiring as its primary or secondary path, the explosive surge can damage even non-electronic appliances that are connected. Even if most of the lightning current takes other paths to ground, the home's electrical system will experience enough of a surge to cause potentially significant damage to anything connected to it, electronics in particular. 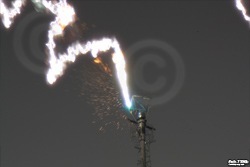 Shock wave damage: Another major source of damage from lightning is produced from the explosive shock wave. The shock waves that lightning create is what produces the thunder that we hear, and at close range, these waves can be destructive. Lightning can easily fracture concrete, brick, cinderblock and stone. Brick and stone chimneys are commonly damaged severely by lightning. Lightning's shock waves can blow out plaster walls, shatter glass, create trenches in soil and crack foundations. Shrapnel is a common secondary damage effect, with objects sometimes found embedded in walls! What about a structure that has no wiring or pipes? It is rare for a house to be devoid of electrically conductive paths to ground, but they do exist - such as camping/fishing cabins. In that case, all bets are off on how the lightning will choose to reach the ground. Again, the lightning has just jumped across miles of non-conductive air, so the lack of wires or pipes won't stop it from passing through a completely non-conductive structure. Such a structure does not provide a person with good lightning protection - so if you are caught in one during a storm, consider moving into a hard-topped automobile which provides a much better degree of safety. What can you do to stay safe from lightning while inside of your house? Since we know the common paths lightning can follow in a house (wiring and pipes), the best thing to do is stay away from those paths as best as possible during a storm. Direct contact with them should be avoided. This includes taking a shower or bath, washing hands, doing dishes, typing on a computer, playing video games and using a wired phone, tool or appliance. Metal-framed windows should be avoided. Wireless devices are safe to use (cell phones, cordless phones, remotes, etc). Direct skin contact with earth ground should also be avoided, as lightning current can travel through soil and across wet/damp concrete. Wear shoes if walking in a basement, garage or patio. If your home is hit directly by lightning, your immediate concern should be for any fires that may have been ignited. Call the fire department! Again, the most common place for lightning-caused fires in a home is in the attic, but they can start anywhere the lightning has traveled. Some fires inside the walls and attic may not be immediately apparent and not easily accessible. You should also watch for falling debris from damaged chimneys, shingles or walls. You should also strongly consider contacting an electrician to have your home's electrical system inspected for any damage that might present a future fire hazard. Can you get struck by lightning inside of a house? While it is rare, yes, it is possible to receive a lightning injury inside a house. Burns and electric shock injuries can occur when someone is in direct contact with one of lightning's chosen paths to ground. The most common indoor lightning injuries involve a person talking on a corded phone or resting on/looking out of a metal-framed window. "Side flashes" (discussed above) that jump across rooms can also cause injuries, but are very rare. Indirect shrapnel-related injuries from building materials have also been documented. It is nearly impossible to provide 100% protection to sensitive electronics from a direct lightning strike. The best thing to do is to unplug any high-value item you wish to protect during storms, as surge protectors and UPS units can't provide direct-strike protection. Some could argue that the risk of a direct strike to any given house is too low to justify unplugging everything for every storm that passes overhead. It's wise to make sure your homeowner's or renter's insurance covers lightning damage. Your insured expensive electronics can be replaced, after all. However, consider irreplaceables such as the data saved on your computer (photos, videos, work files, etc). You can mitigate that risk by performing frequent offsite backups and/or storing data on an external hard drive that you can unplug when needed. Should I have a lightning protection system installed? A professionally-installed and well-grounded lightning protection system will reduce or eliminate the fire and injury hazards if your house happens to be struck directly. You will want to assess the risk of a strike and weigh the costs versus benefits. Insurance may be a more cost-effective option, especially if you live in an area of average to below-average thunderstorm frequency. If you are located in a zone if frequent lightning activity (such as Florida and the Gulf Coast regions of the USA), a protection system may offer more of a benefit. 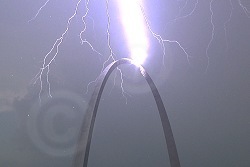 Read more about lightning protection systems. Do surge protectors provide total lightning protection? Discussing myths about surge protectors, UPS devices and lightning protection for sensitive electronics. 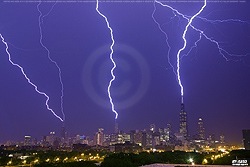 Frequently asked questions, photos and videos on lightning strikes to Chicago's tallest buildings.